2,184 pages | 824 B/W Illus. 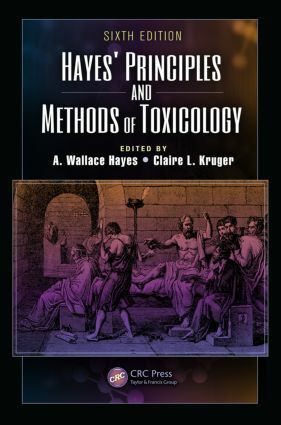 Hayes’ Principles and Methods of Toxicology has long been established as a reliable reference to the concepts, methodologies, and assessments integral to toxicology. The new sixth edition has been revised and updated while maintaining the same high standards that have made this volume a benchmark resource in the field. With new authors and new chapters that address the advances and developments since the fifth edition, the book presents everything toxicologists and students need to know to understand hazards and mechanisms of toxicity, enabling them to better assess risk. The book begins with the four basic principles of toxicology—dose matters, people differ, everything transforms, and timing is crucial. The contributors discuss various agents of toxicity, including foodborne, solvents, crop protection chemicals, radiation, and plant and animal toxins. They examine various methods for defining and measuring toxicity in a host of areas, including genetics, carcinogenicity, toxicity in major body systems, and the environment. This new edition contains an expanded glossary reflecting significant changes in the field. The comprehensive coverage and clear writing style make this volume an invaluable text for students and a one-stop reference for professionals. "There are several outstanding features of this book. Its strong suit is its organization, which is flawless in its transition from one chapter to the next. The methodologies in several chapters to assess toxicity are very detailed and a useful resource for toxicologists. This book also captures the advances in technology in a chapter on toxicopanomics which is important for toxicologists to understand to move the field of mechanistic toxicology forward. Each chapter is accompanied by a few questions that can help readers review their understanding and give them an edge in their preparation for the Diplomate of the American Board of Toxicology (DABT) certification. … This is a comprehensive resource for toxicology students and practitioners and is the only book that focuses in detail on the concepts, methodologies, and assessments integral to toxicology. This much-needed update incorporates the advances and developments in the field." Gastrointestinal Toxicology; Robert W. Kapp, Jr.
Pathophysiology and Toxicology of the Heart; Khalid Almuti, Shahid Rahman, and Daniel Acosta, Jr.
Dr. A. Wallace Hayes, a toxicologist with experience in industry and academics, has held Professorships at University of Alabama, University of Mississippi Medical Center and Wake Forest University School of Medicine and is Visiting Scientist at Harvard School of Public Health. He serves on the FDA Food Safety Committee. He has 230 plus peer reviewed publications, is editor for Human and Experimental Toxicology, Cutaneous and Ocular Toxicology, Target Organ Toxicity Series and Food and Chemical Toxicology. He is past Secretary-General of IUTOX, past treasurer of American Board of Toxicology (ABT), past president of the American College of Toxicology (ACT), Toxicology Education Foundation, and Academy of Toxicological Sciences (ATS) and past member of council of Society of Toxicology (SOT). He is a diplomate of ABT, ATS, American Board of Forensic Medicine and American Board of Forensic Examiners. He is a Fellow of ATS, Institute of Biology, American College of Forensic Examiners and American College of Nutrition. Dr. Hayes is European Union registered toxicologist and certified nutrition specialist. Dr. Hayes has been honored by SOT with its Merit Award, by Mid-Atlantic SOT with its Ambassador Award , by ACT with its Distinguished Scientist Award and by International Dose-Response Society with its Outstanding Leadership Award. Dr. Hayes was named Distinguished Fellow by ACT in 2013. Dr. Claire Kruger, PhD, DABT, CFS, currently serves as President of Spherix Consulting, Inc. She is an instructor at Harvard in Environmental Toxicology and Risk Management, as well as a guest lecturer at the University of Southern California and the University of Kentucky. Dr. Kruger served as the CEO of a NASDAQ listed pharmaceutical company, leading the development of drugs in the metabolic disease space. She also has more than 25 years of scientific and regulatory consulting experience in food ingredients and pharmaceuticals with over 80 publications and invited presentations. She serves as an Associate Editor of Food Chemical Toxicology, and is a member of the Society of Toxicology, the American College of Toxicology, the Institute of Food Technologists, and the American College of Nutrition.